(in Russian, “volnovoi kanal,” or antenna Uda-Iagi), also called a director antenna; a traveling-wave antenna in the form of a series of parallel, linear electrical dipoles, each close to 0.5 wavelengths long, mounted in the same plane along a line coinciding with the direction of maximum radiation or reception. 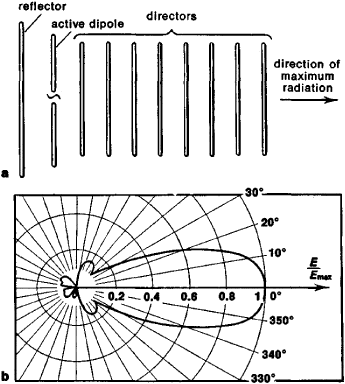 The active dipole in this antenna (see Figure 1) supplies the energy of high-frequency oscillations; electrical currents are induced (excited) in the passive di-poles by the spatial electromagnetic coupling between them and the active dipole. The phase of the currents in the reflector and the directors, which is controlled by adjusting their lengths, is established so that a traveling wave is formed along the antenna, moving from the reflector to the directors. To tune the antenna, the directors are shortened by 4-10 percent, and the reflector is lengthened by 5-10 percent compared with the active dipole, whose length is somewhat less than 0.5 wavelengths; the separation between dipoles is usually 0.1-0.3 of the operating wavelength. The front-to-rear factor of such antennas increases with the number of passive dipoles, reaching 20-30. Yagis are used for transmitting and receiving, mainly in the metric wave band, particularly for the reception of television programs. Metuzalem, E. V., and E. A. Rymanov. Priemnye televizionnye antenny. Moscow, 1968. Yagi employs the term Amerindian throughout the work. Tucked inside the exterior casing, the traditional Yagi elements -- metal antenna dipole, directors, reflectors, low noise and anti-interference amplifiers -- are re-engineered to achieve a similar gain level and receive uncompressed high definition digital signals. The MIMO Yagi antenna is a high gain, dual polarized antenna, designed to provide point-to-point, field area, and point-to-multipoint connectivity over long distances and in harsh conditions. As can be seen from radiation pattern of Yagi antenna it's scattering into the back direction is very large. Bu calismada kombine fakoemulsifikasyon-arka kamara goz ici lensi (AK-GIL) implantasyonu ve transpupiller silikon yagi cikarimina bagli kornea endotel hucre degisikliklerinin degerlendirilmesi amaclanmistir. Based on the bidirectional Yagi antenna mentioned in the last section, we propose a stacked bidirectional antenna in this section. Para las pruebas se utilizaron las antenas de dipolo de media onda, dipolo vertical y yagi. Using unique reagents from the Yagi group, the Felding team discovered that the balance of key metabolic cofactors processed by complex I-specifically, nicotinamide adenine dinucleotide (NAD+) and NADH, the form it takes after accepting a key electron in the energy production cycle-was disturbed in aggressive breast cancer cells. In addition, good directional radiation performance is achieved due to the characteristics of the Yagi antenna. Balina yagi ise cok iyi bir emulgator olmakla birlikte doganin korunmasi gerekcesiyle birakilmistir (6). Yagi said the company plans to ask for rate hikes to both corporate users and households, while vowing to thoroughly improve its business efficiency through such efforts as reviewing personnel and advertisement expenses.